Not much different, but a change none the less. Good news??? My husband loves it! I was a bit taken aback by how much he liked it. He was happy I finally did something for him, lol. 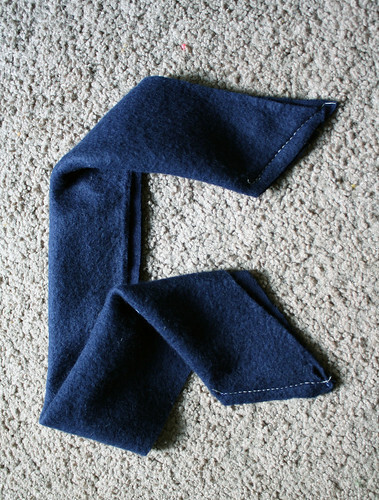 Now, if only I had a little boy to make a matching one for…. –Elastic (think broken hair elastics, elastic that holds new shoes together, sewing elastic, etc). 1. 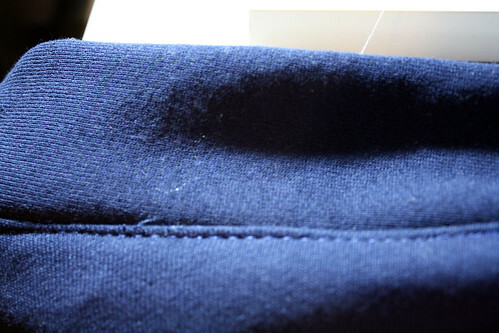 Grab your seam ripper and take off the hood. (It’s really not that time consuming). 2. Take your measuring tape and measure around the neck to determine a rough estimate. Go higher than lower in the measurement to be on the safe side. 3. Take the hood and cut a piece from it that will become the new collar part. I just made mine 2 or 3 inches longer than the measurement around the neck opening. For the height, double the height that you desire. My piece totaled 26″ x 5″. 4. 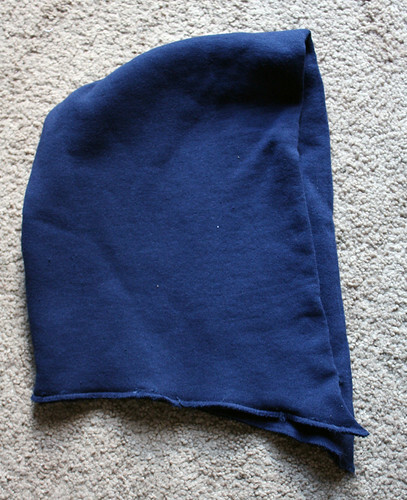 Fold the piece in half long ways, right sides facing, and cut at an angle on one end. You want the cut angling in towards the side that is open. My picture shows if the fabric was facing wrong sides together. 5. To make the other side even, fold in half and match up ends to cut at the same angle. 6. 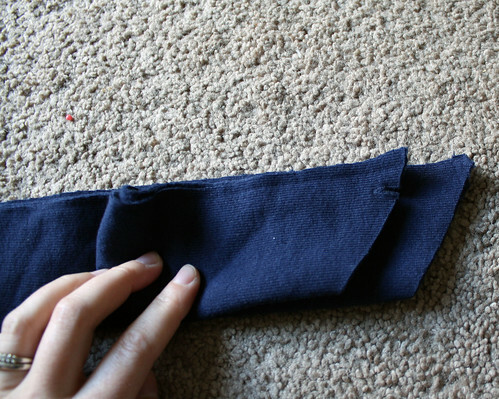 Sew the side angles together and turn right side out. 7. Next, cut a square/rectangle piece. This is the part that will make it look like there’s a flap. I cut mine to be 5.5″x 5″. 8. 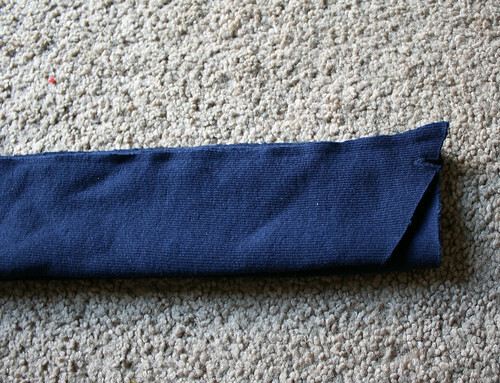 Pin three sides down and sew. Leave the top unsewn because the collar will cover that up. 9. 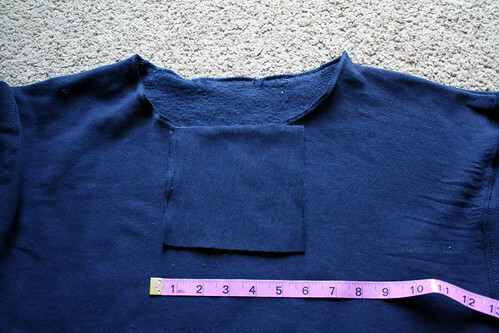 Pin the square/rectangle piece onto the middle top of the shirt and sew on. 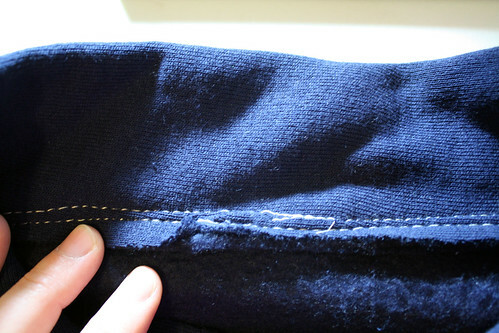 Just sew right over the sewing you just did to hold the sides down. 10. 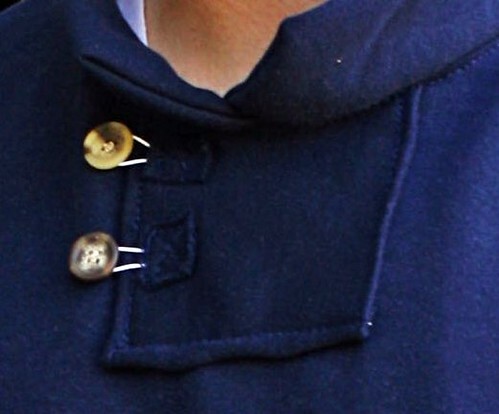 Now, pin on the collar, with the top facing down. You want it to overlap a little. If you don’t like how it overlaps, take off and cut some off or recut a piece if not long enough. 11. 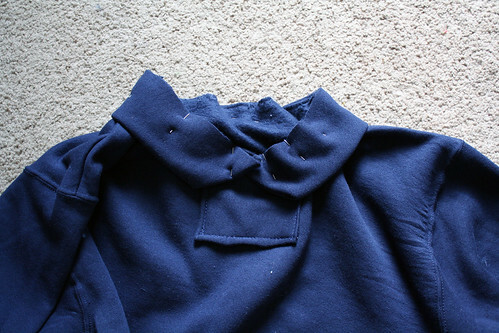 Sew the collar and shirt together. 12. 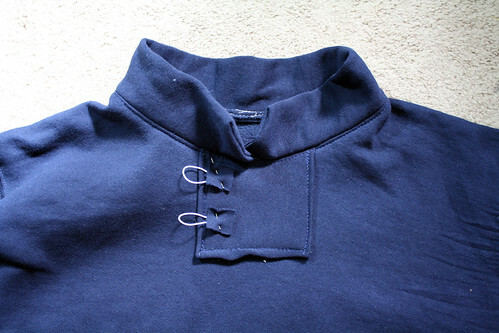 Flip the collar up and push the seam down. 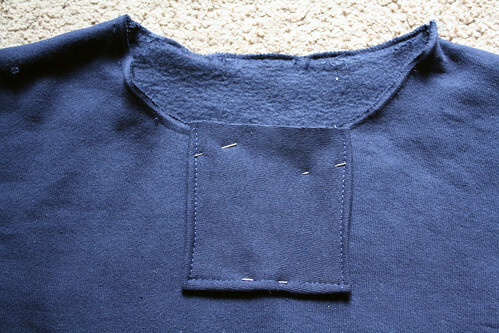 Sew around the neckline to sew down the seam. 13. Cut 2 to 3 small squares (depending on how many buttons you want to add. 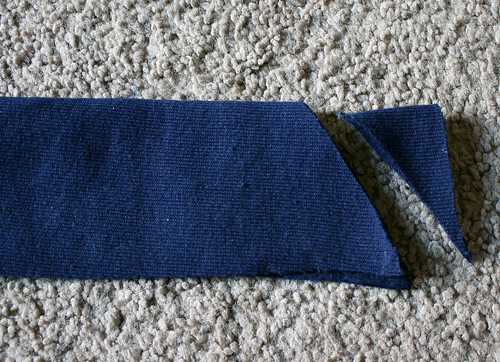 I did two) and cut 2-3 small pieces of elastic (mine were 3 inches long each). You will just have to play with the length of the elastic. I just placed my buttons where I wanted them and figured how much I would need to stretch from the square to the button for it to work. 14. Place the square on the side of the square/rectangle with the elastic underneath and pin. 15. 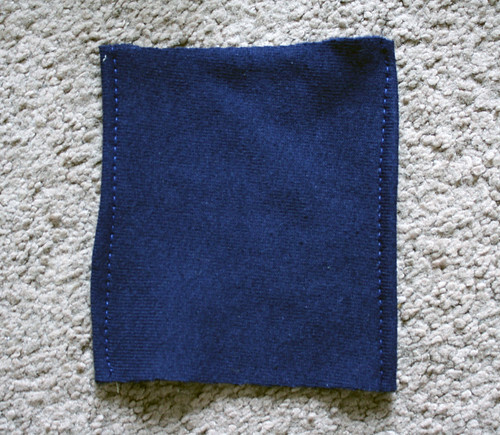 Sew around the small squares (I went over the elastic side a few times to make sure it would hold good) and then sew an x in the middle of the small squares if desired. I like doing it for looks and for the extra hold. 16. 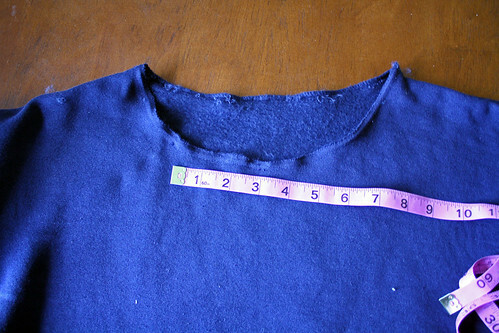 Determine where you want the buttons and hand sew them on. Put the elastic around them once on and you are all done! That is so fantastic!! I love that you found something to make for your husband. I’ve been trying to think of something for months! Love it! So glad to see something for the guys for once. Seems like everything is all about us girlies! Very clever. That is so awesome! I will have to make one of those for my hubby. He has waaaayyyy to many hoodies, so it will be nice to make him something different! Thanks! I love this! And although I don’t enjoy sewing for boys nearly as much as I do for girls, I’ve been struggling to find boy-ish things for my little bear! Oh I love this! I am going to have to make one for my son. What do you mean MEN’S? I want one! And I don’t have a husband…or a boyfriend! you could totally do this with a cable-knit sweater or something too. Love love love! Thanks! This is such a fabulous idea! Yes, I like this one. It’s still a comfy sweatshirt for him, but with more sophistication. Excellent job! Sweet!! i’m making one for my father in law. Hoods drive him nuts!! Finally a gift for men! Hurrah! That looks fantastic! I love the new design, it’s great! Thanks so much for sharing this, I’ll be linking. I love this! 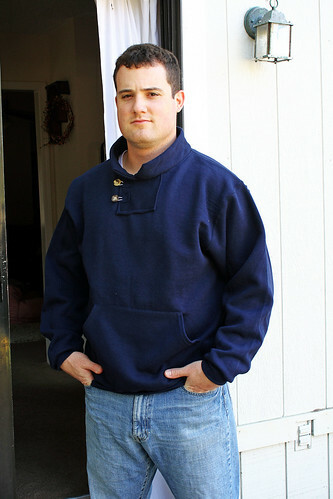 My hubby is always complaining that sweatshirts choke him. With this, I can make the neck larger and have it look nice! TFS! Fabulous transformation! I think my hubby would love this look too! yeah what everyone else is saying!! 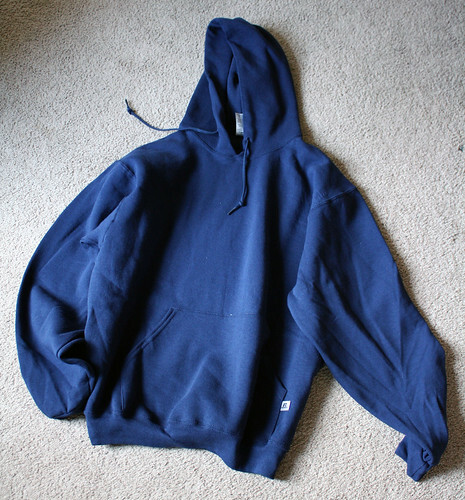 My son is complaining about the hood on his hoodie -but the body fits so well – this might be a good way to save it for another season of wear before he outgrows it! WOW, THANKS FOR THE EYE CANDY!! !